Due to payment problems, we can no longer recommend playing poker at Carbon Poker. Instead, we recommend you try Ignition Poker. The links and banners on this page will direct you to Americas Card Room. You can read our review of Ignition Poker here. This review will remain intact for historical purposes. Carbon Poker formed in 2005 as part of the Merge Gaming Network, which is an Australian company. Carbon Poker was officially established as a distinct entity in 2007, with servers based in Kahnawake, Canada, and licensed and regulated by the Kahnawake Gaming Commission. Carbon Poker accepts players from the United States, and that support extends to the Carbon Casino, sportsbook and racebook; in fact, the Carbon brand uses a unified account system that is very flexible and user-friendly. Carbon Poker accepts players from the USA and offers easy depositing via Visa. All new customers receive a 100% deposit bonus for a maximum amount of $1,000! With your single Carbon account, you can not only play poker, but bet on Sports, the Racebook, and play at the Carbon Casino. Carbon Poker is also totally mobile. With a mobile poker version developed in HTML5, you can play poker on your iPhone, iPad, or other smart-device WITHOUT having to purchase or install any kind of app! Carbon Poker offers a sophisticated, stable system and a wide range of poker and personalization options. The poker room also provides a lot of bonus opportunity for loyal clients. Since online poker players tend to want to become regulars at a particular site, this is a great match. With regular reload bonuses in addition to a loyalty program, there’s a lucrativeness available here that simply isn’t available at most online poker rooms. Carbon Poker uses the network and proprietary software of the Merge Gaming Network. The software uses Macromedia Flash. It doesn’t have instant-play capabilities, however, and users will need to download and install either the Windows or the Mac edition. 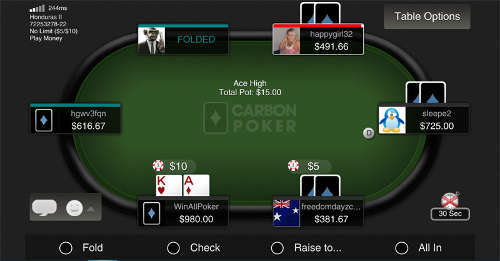 Carbon Poker also offers a mobile app. It currently supports Apple iPhone and iPod Touch. Support for the iPad and Android devices is in the works. The app does come with limitations, such as fewer table options and no support for tournaments, but that’s in the works as well. 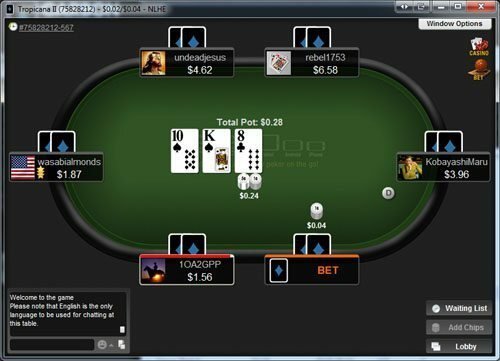 As with most online poker rooms, the focus at Carbon Poker is the Texas Holdem variant, and you’ll find both public and private tables available. Other poker options include 5-Card Stud, 5-Card Draw, 7-Card Stud, 7-Card Stud Hi/Lo, Ace-to-Five Lowball, Badugi, Deuce-to-Seven Lowball, HORSE, Omaha, Omaha Hi/Lo and Razz. Carbon Poker also offers a wide range of tournaments, including those that serve as satellites for major poker events throughout the world. In addition, Carbon Poker members have access to the Carbon Casino and the sportsbook and racebook at Carbon Sports. Carbon Poker welcomes all new clients into the fold with a welcome bonus worth up to $1,000, and you can claim it all on that very first deposit. How it works is that you register a new, first-time account, make a deposit of at least $25 and use the promotion code CARBONPK during the deposit process. The promotion is a match bonus of 100 percent, so if you deposit the minimum $55, you’ll earn $50 in bonus money, and if you deposit $1,000, you’ll get the maximum bonus of $1,000. Carbon Poker doesn’t award you the bonus money all at once. Instead, it awards it to you as your clear it. Bonus money clears at a rate of $1 per 150 VIP points, and Carbon pays out the bonus in $10 increments. VIP points are explained in detail in the Rewards Program section. Keep in mind that a withdrawal will forfeit any unclaimed bonus money, so it’s important to complete the bonus opportunity completely before making a first withdrawal. Carbon Poker has at least one reload bonus available each month for established clients, and that opportunity is worth at least $500. To claim the bonus, players will have to use the appropriate code. Generally, the code is based on the month, such as MARCHPK or JUNEPK, but be sure to check the site for current information. Many weeks, Carbon will offer additional reload bonus opportunities. Sometimes, it offers 5-percent Thursdays and Fridays, which are stackable with the main monthly reload bonus. In all cases, the minimum deposit is $25, and the bonus clears at a rate of $1 per 150 VIP points. The Carbon rewards, or loyalty, program has three tiers: Carbon, Carbon Plus and Carbon Elite. Clients are automatically included in the program when they register an account but no benefits are afforded until they reach the base Carbon level, which requires accrual of 500 VIP points in the previous month. Carbon Plus requires 5,000 points and Carbon Elite is invite only. VIP points are accrued every time a client purchases a tournament buy-in or contributes to a raked pot in a ring game. The benefit of VIP points, besides clearing bonuses money, is that they convert back into cash. The VIP-to-cash exchange rate is 10 percent at Carbon, 15 percent at Carbon Plus and 35 percent at Carbon Elite. Carbon Poker also has a robust promotional calendar that updates on a monthly basis. Freerolls are a highlight of that calendar, and there are usually multiple opportunities for players to participate in free tournaments each month. Generally, clients will have a number of ways to claim free tickets. The easiest way is to apply the promotion code CARBONPK to a deposit. You’ll note that it’s the same promo code used for the welcome bonus, which means that new clients automatically claim their free tickets in the process. Free tickets are also awarded for the use of reload codes, such as FEBPK or AUGPK. Carbon Poker is an excellent option for high rollers because the banking system is fast and hassle-free. The promotional structure is also quite good, and players who make large deposits can gain access to the Carbon Elite rewards tier within 30 days. Carbon Elite provides many additional benefits, including anytime reload bonuses and a high VIP-to-cash exchange rate. Click here to try out Carbon Poker. As mentioned above, due to recent news, we can no longer recommend playing poker at Carbon Poker. For US poker players, there are two clear options for online poker (if you reside outside of New Jersey, Delaware, and Nevada) – and that is Ignition Poker and Americas Card Room. Please read our reviews at http://gpsts.org/ignition-poker-bonus-code-review/ and http://gpsts.org/americas-cardroom-bonus-code-review/ to learn more. Can't withdraw without depositing more into a system that clearly will not pay out. All signs point to being a scam site. I've lost my buy-in but you can save yours. Payment issues with Carbon Poker. Requested a check and it took weeks. When I finally got it, I tried to deposit it and it bounced! Bank charged me $35 for trying to deposit a bad check and Carbon does not reimburse you that fee even tho it is their fault!